A swim lane (or swimlane diagram) is a visual element used in process flow diagrams, or flowcharts, that visually distinguishes job sharing and responsibilities for sub-processes of a business process. The swim lane flowchart differs from other flowcharts in that processes and decisions are grouped visually by placing them in lanes. Parallel lines divide the chart into lanes, with one lane for each person, group or subprocess. Lanes are labelled to show how the chart is organized. In this particular example you’ve a swinlane for Issues, other to Error correction and another to New features. 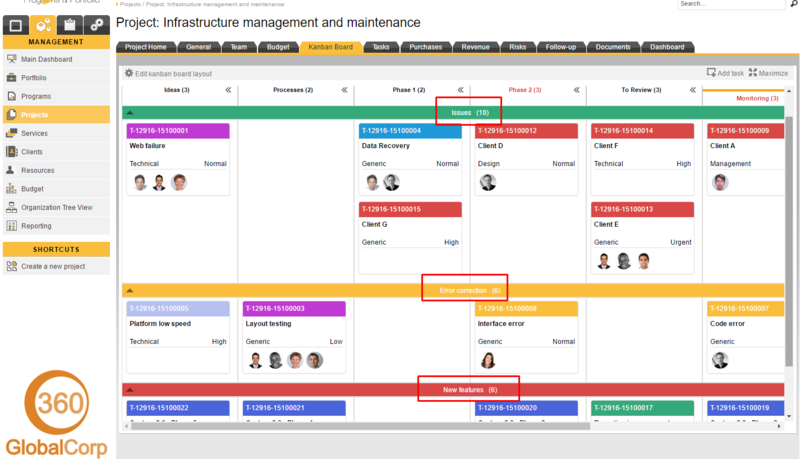 Please check how you update Kanban board here!